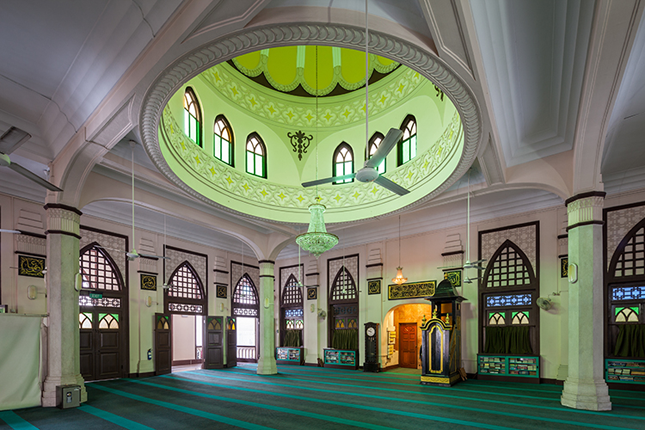 Hajjah Fatimah Mosque is one of the oldest mosques in Singapore, a rare example of one named after a woman. 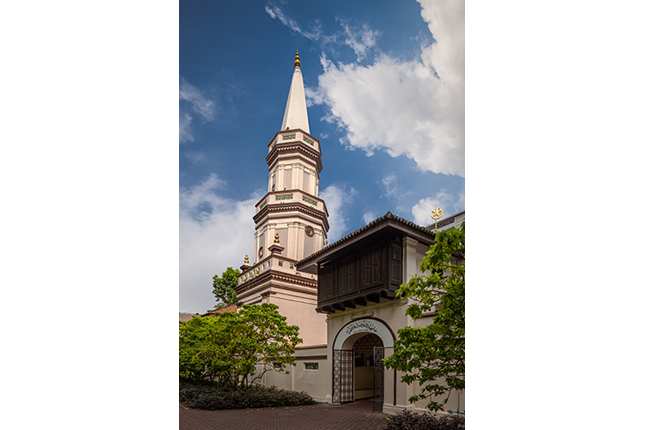 Its unique eclectic architecture stands out from other mosques in Singapore, especially with its distinctively European-style minaret, which tilts slightly. 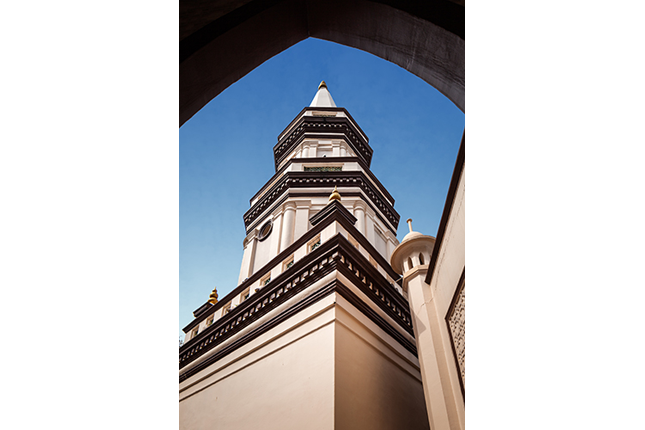 The mosque bears testimony to the once thriving Muslim communities living in the vicinity who made significant contributions particularly to colonial Singapore’s economy. Once known as Java Road Mosque after the adjacent road which is now expunged, Hajjah Fatimah Mosque was commissioned by its namesake in 1845. It is believed that Hajjah Fatimah was a wealthy businesswoman who married a Bugis prince-merchant from Celebes (today’s Sulawesi, Indonesia). Hajjah is an honorific title given to a Muslim woman who has completed the hajj (pilgrimage) to Mecca. Following her husband’s death, the young widow continued to manage the business with great success and amassed a considerable fortune. Before the mosque was built, her family residence occupied the site. Burglars broke into her home twice, and it was even set ablaze on the second occasion. Hajjah Fatimah was fortunately away at that time and was unscathed. When she returned, she attributed her good fortune and providential escape to Allah. As a form of thanksgiving, she erected a mosque on the present site and rebuilt her house nearby. In the past, the mosque stood next to the sea; this explains why the road in front of it is called Beach Road. The mosque used to serve the Muslim communities living in the surrounding kampongs, including Malays, Bugis, and Arabs. They were primarily labourers and merchants, and had worked for the growth and development of Singapore as a British trading port. 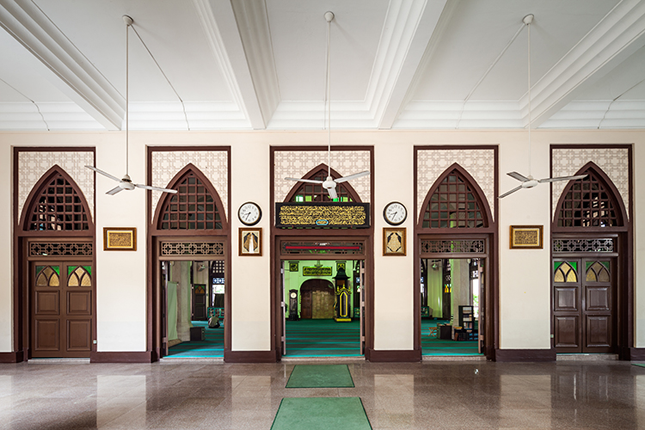 Hajjah Fatimah Mosque combines both Indo-Islamic with European features in its architecture. 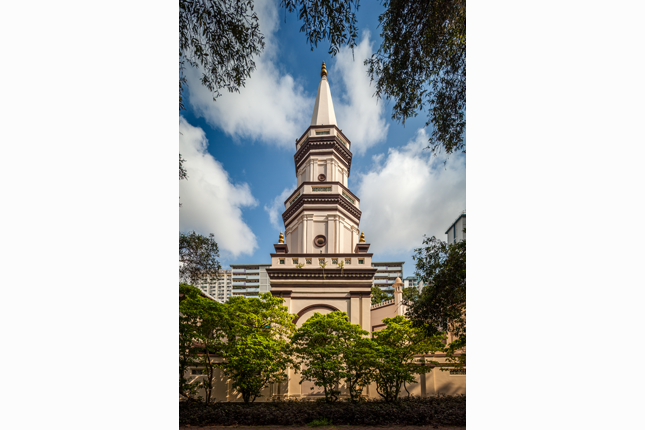 Its most distinct feature is certainly the minaret, which resembles the Neoclassical steeple of the first Saint Andrew’s Church. The octagonal minaret tower rises from a square base, and began to tilt after its construction. While the tilt was supposedly corrected during renovations in the 1970s, it still appears to be leaning slightly, thus earning its nickname, the ‘Leaning Tower of Singapore’. The mosque's earliest sections, including the steeple-minaret, are believed to have been constructed under the purview of Governor Surveyor John T. Thomson, although there are no sources to confirm this. A huge golden ogee-shaped (onion-shaped) dome crowns the main prayer hall. Twelve openings covered with yellow and green glass panels were installed at the dome’s circular base in groups of three at each cardinal point. The roof perimeters are lined with merlon cresting that is broken by miniature cupolas at regular intervals. Aligned to the qibla (orientation towards Mecca), the main prayer hall is skewed to an angle on the lot. A section of it was rebuilt circa 1930 following the designs of the architects from the local firm Chung & Wong. Malay artisans and craftsmen were engaged to work on the project. Numerous lancet-shaped windows, which are typical of Neo-Gothic architecture, can be found around the mosque, ensuring that the interior is well ventilated. Enclosed verandahs surround the prayer hall on three sides. The mosque's mausoleum stands directly behind the mihrab, a deeply recessed niche on the wall in the main prayer hall that indicates the direction of Mecca. It contains three tombs in traditional Islamic style, which hold the remains of Hajjah Fatimah; her daughter, Raja Siti; and her son-in-law, Syed Ahmed Alsagoff. A small cemetery outside the mausoleum is reserved for the burial needs of Hajjah Fatimah’s family members. Besides the residents in the neighbourhood, people working in the offices nearby also frequent Hajjah Fatimah Mosque, especially for Friday prayers. The mosque is currently managed by the Islamic Religious Council of Singapore (Majlis Ugama Islam Singapura, MUIS).